34% of mobile owners use their phones to research and compare prices of products at least once a month. With so much internet activity now being relegated to mobile devises, it is essential that every brand have a mobile enabled version of their website that is not only optimized for the small screen of a mobile device, but that it is integrated into their overall marketing strategy. It is true that the behavioral patterns of mobile users who access a brand from a mobile device are different from when they interact with a brand from a standard desktop display. They are actually looking for less, but more specific information. Typically the consumer is seeking products and services information, directions and an easy way to contact the brand (click-to-call or simple striped down contact forms). There are a variety of different templeted solutions that are typically used; however these have a tendency to lose continuity with the brand. At the end of the day there is no substitute for a simplified customized mobile website that accurately reflects the “mother ship”. 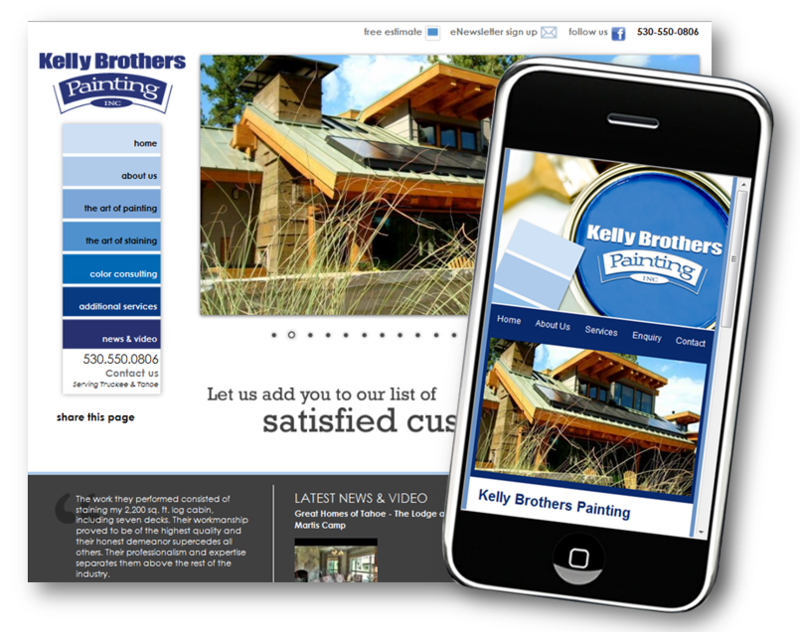 When we took over the Kelly Brothers Painting website it appeared as a postage stamp when accessed from a mobile device. The text was too small to read, the navigation buttons too small to press, and the contact form too unwieldy to use without an inordinate amount of patience. Make the image of the paint can prominent because that is a consistent factor in all their email marketing templates. Since the painting industry is all about making things look better, we wanted to incorporate the same slideshow that is on the original full-size version to maintain the emotional connection. We incorporated the same video that is on the main site into their mobile site. We gave the consumer direct access to an interactive Google map to quickly locate the shop while on the go. We employed a “tap-to-call” function so the consumer can just tap their Smartphone to instantly call the shop without having to leave the website and enter the phone number. Ensured their Social Icons were on the bottom of every page so the consumer can follow them on Facebook, Twitter and LinkedIn. Different industries require different solutions, but what remains consistent is providing a user friendly experience that is rewarded by increased consumer interaction and higher placement in the search results in the major search engines. With brands increasingly paying attention to their mobile web presence, there are now a lot of well designed mobile websites to model your site after. You can view a few of them on our own Mobile Website Design Portfolio. Kreative Webworks, Inc. is a professional digital marketing agency in Orange County CA specializing on Online Lead Generation since 1999.